Grilled Cheese Day at Cathexis! The team at Cathexis celebrated St. Patrick’s Day with a potluck grilled cheese lunch! 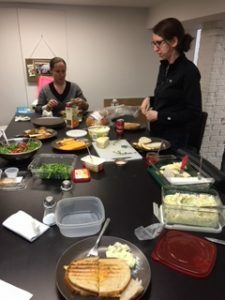 There was a variety of cheeses to choose from (cheddar, brie, goat, and friulano), fresh sourdough bread, exciting toppings (pears, red pepper jelly, and spiced peaches), as well as green salad, potato salad, and tomato soup on the side. Sandwiches were freshly grilled on the panini press. Delicious! Happy St. Patrick’s Day!